Florian Cafe: Oh, That's Ridiculous! 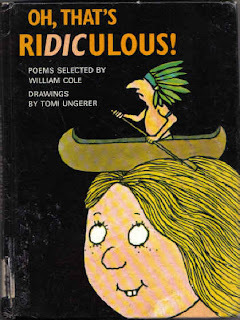 About twenty years ago I picked up a treasure at a flea market for a dollar: OH, THAT'S RIDICULOUS, with poems selected by William Cole and drawings by the irreverent Tomi Ungerer. This is the hilarious book that pushed me into the world of children's poetry. William Cole was the gentleman who helped launch light verse into the mid-twentieth century, and today is his birthday. Cole was an early enthusiast of Shel Silverstein. This book was published by The Viking Press in 1972, two years before Silverstein's own big collection Where the Sidewalk Ends. I was fortunate enough to meet Mr. Cole at a Poetry Fest at Fordham University on the very day that Shel Silverstein died. Cole told me that he had a collection of several thousands books of light verse. There was a young lady of Spain/ Who was dreadfully sick on a train, / Not once but again,/ And again and again,/ And again and again and again. Today my $1 copy is perhaps worth hundreds. Cole and Ungerer had a number of collections like this, all of them I treasured as a boy, but my favorite is Beastly Boys and Ghastly Girls which also features some Silverstein, published in 1964. I, too, own thousnads of children's poetry books. It means I sometimes lose track of certain books. I just pulled OH, THAT'S RIDICULOUS! off the shelf thanks to your post. I think I'll read through it today. Another book of humorous poems selected by Cole that my elementary students and I enjoyed is POEM STEW. I used to read from it often. In fact, I kept multiple copies of the book in my classroom. Ungerer also drew Flat Stanley, my role model for sneaking into an editor's office, along with the Expect the Unexpected posters for the Village Voice. And he created great children's books himself, a future post.